Earlier this year, Fox News reported that Dutch researchers found that video games that promoted fruit consumption failed to influence childrens' snack choices: the study illustrated a correlation between food-themed 'advergames' and hunger, but not healthy snacks over their less nutritious counterparts. However, I was interested to learn that a separate study, conducted by Georgetown's Sandra Calvert, found a positive correlation between Pac-Man and snack choice (fruit vs. chips). Per the article, "It might have to do with the game. He's a very famous and familiar icon and he gets rewarded for eating healthy food and punished for eating unhealthy food." 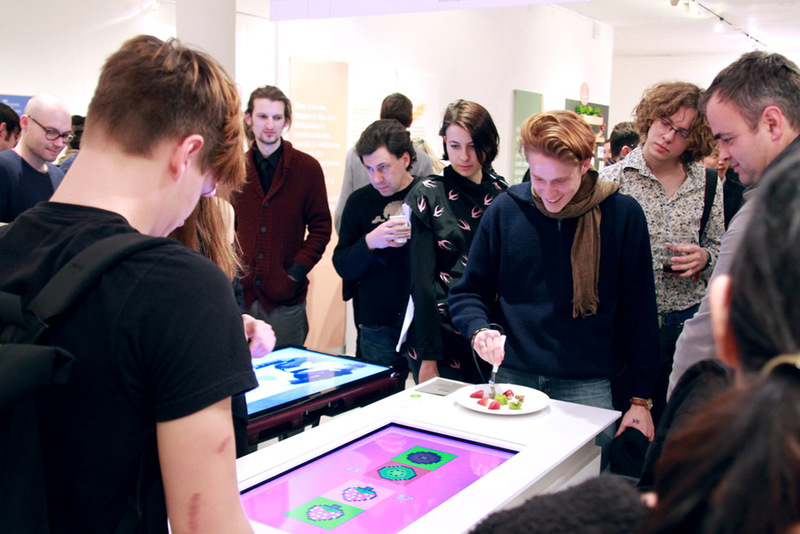 Which is a long way of introducing a video game that actually does encourage healthy eating habits by gamifying them. "Pixelate," a project by RCA Design Interactions students Sures Kumar and Lana Z. Porter, is billed as a "Guitar-Hero-style eating game in which players compete in a one-minute showdown to see who can eat the most food in the correct order." 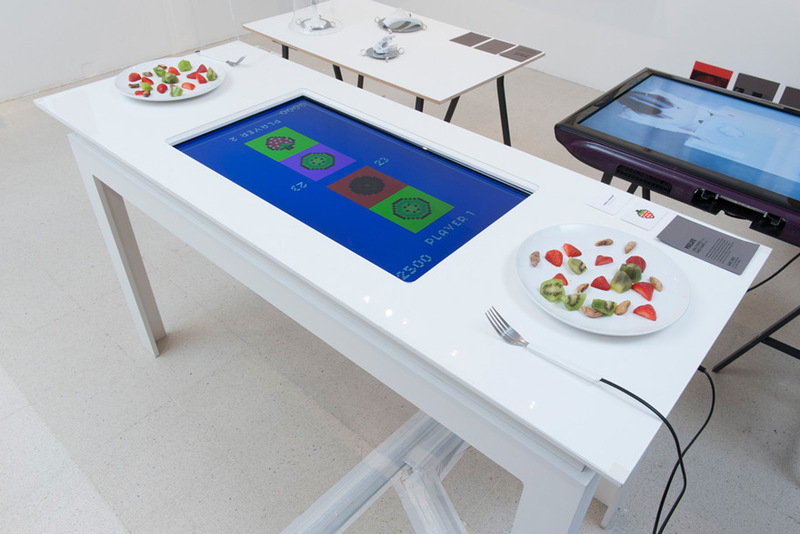 A digital interface built into a custom dining table shows players which foods to eat and when, while the game detects whether they've eaten the correct food by measuring the food's resistance on the fork. Potential applications for Pixelate include encouraging children to eat more healthy foods, helping to manage portions, and educating children and adults about nutrition. 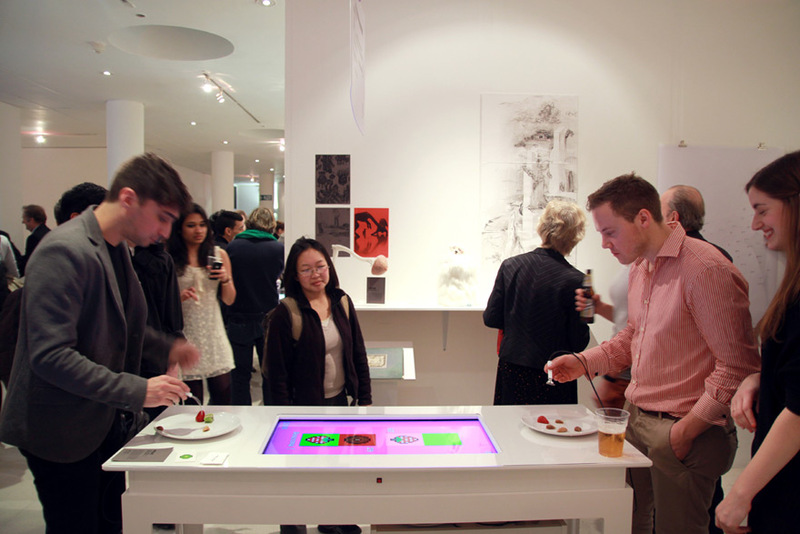 Built using Arduino and openFrameworks, Pixelate gameifies the act of eating, challenging players to consider whether they think before they eat, or eat before they think. Kumar and Porter were happy to share the behind-the-scenes story behind "Pixelate." 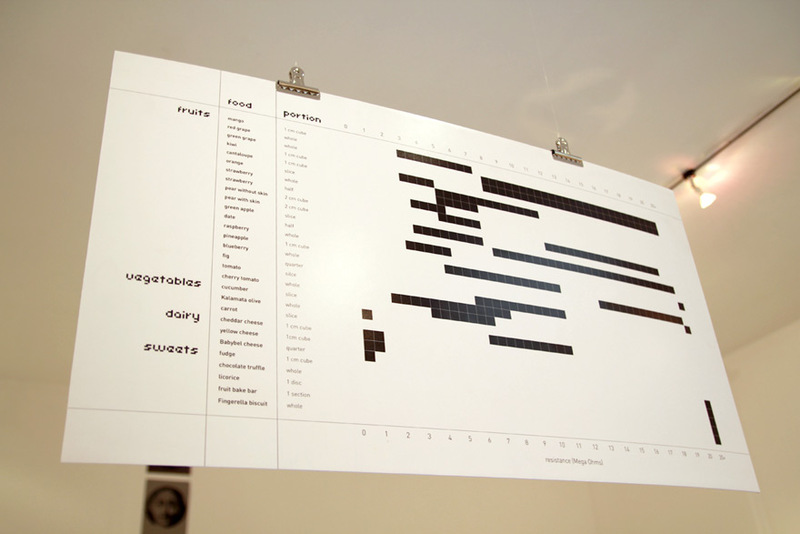 During the prototyping process, we made a chart to document the resistance of different foods. We were determined to use resistance as the variable for determining what food is on the fork, so we picked foods for the game that were electronically distinct enough for the program to differentiate between them. There's also a lot of variability in the resistance based on the amount of food tested, whether it's been cooked, where it's been sliced, and how long it's been left out for a while. Strawberries, kiwis, and figs made it to the final menu. We also noted a trend in the resistance of "healthy" versus "unhealthy" foods based on the water content/density of the food. The more artificial, dense, or processed the food, the less it conducted. 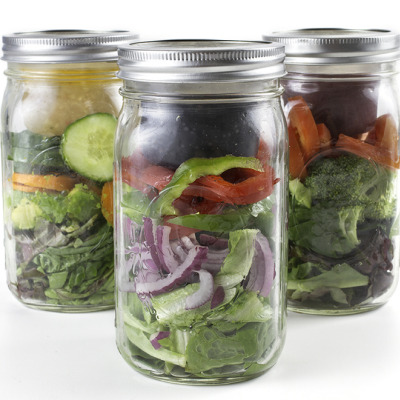 Fruits and vegetables, which have a higher water content, were much better conductors. 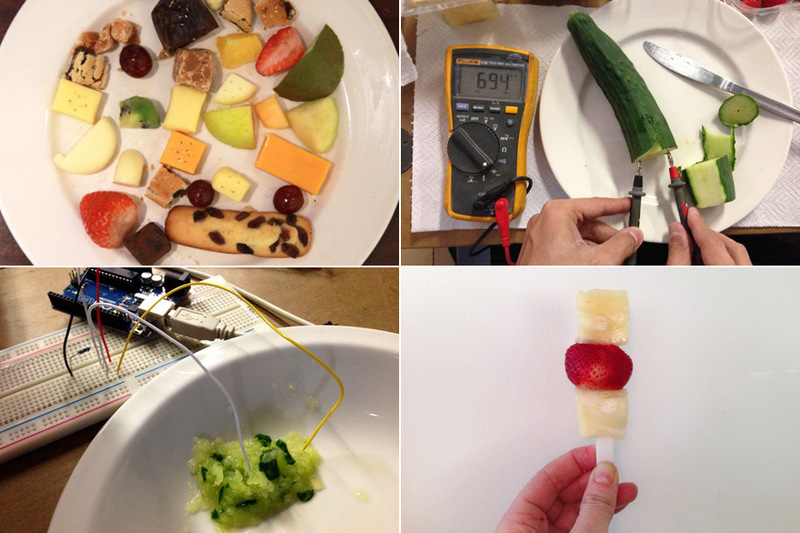 So the harder it is to pass electricity through a food, it seems, the unhealthier it is (not a rule, but definitely a trend).The prototyping and testing process was messy, to say the least. As the chart suggests, we went through a lot of different foods to figure out which ones we would use for the game. 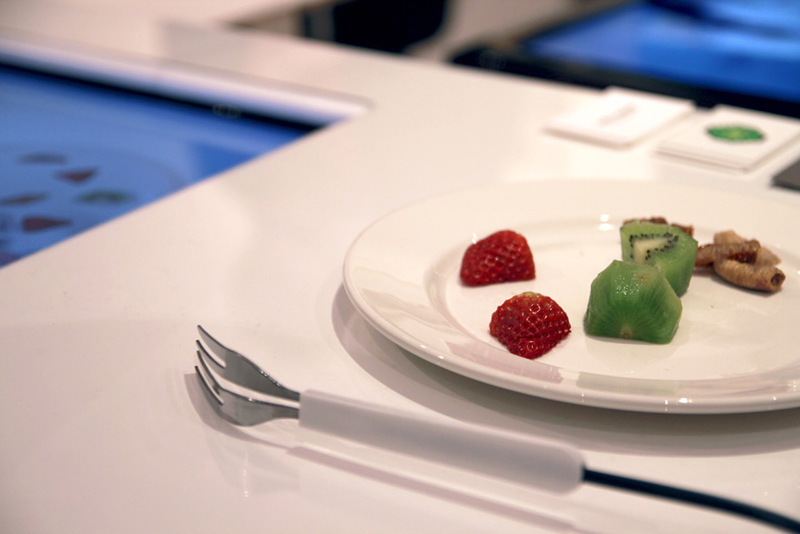 In our initial prototype, we used carrots, bananas, strawberries, and potatoes, but found the combination pretty unpalatable, especially when trying to eat quickly. 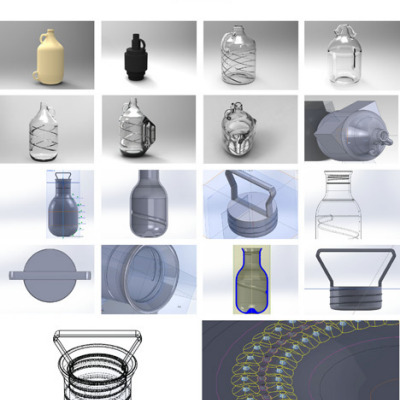 With our classmates Johanna Schmeer and Mohammed Jaffar Ali, we demoed the project for the Design Interactions department using a projected game surface, then we refined the game and built the custom table and forks for the exhibit. When conceiving the game, we were initially inspired by arcade culture, and the news stories we'd seen about teenagers who were so attached to their video games that they wouldn't leave their bedrooms. The 8-bit aesthetic is a nod to what video games used to be: simple, fun, and strangely addictive. 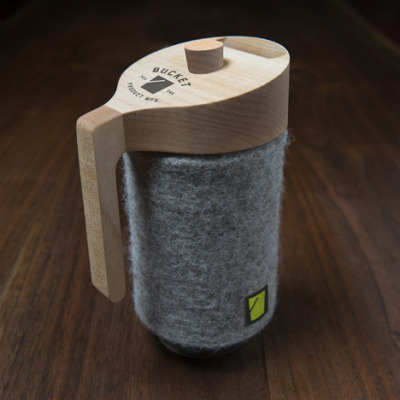 It's partly nostalgia, but we also were interested in playing with the idea of basics. It's easy when playing video games to get into a flow and not think about basic needs like eating or sleeping. When you make eating the object of the game, all bases are covered. In the same way that food is fundamental to our existence as animals, pixels are the fundamental elements of the digital image. "Pixelate" is a marriage of the two. People had a lot of fun playing the game. Some people really got into it, you could see their eyes flitting between screen and plate, plate and screen. Others were less comfortable with the idea of eating against the clock, or eating as a form of competition (contrary to the idea that a meal is meant to be enjoyed with someone, not against them). We would be interested in trying the game with kids using different fruits and vegetables, and perhaps adding nutritional information about the foods to the game. 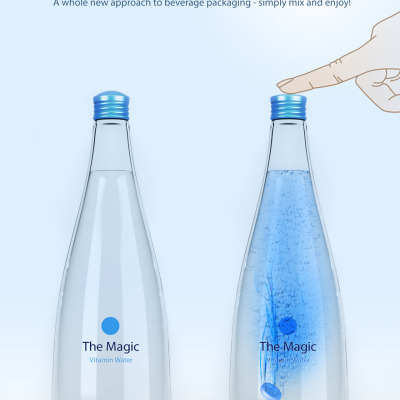 'The Magic' Bottle Cap Packaging Concept, Yea or Nay?